While we were fixing the paint weights on the model for our main character, I went ahead and did a few animation tests. I made a very simple rig consisting of a sphere and two ears to practicing conveying emotion with body language. As ears are a very big feature of a rabbit I decided to practice animating them. This run cycle (both are the same animation just shown at different angles) was mage using the most usable version of the rabbit rig. This was mostly to see whether there were any major faults with the rig itself that would affect the geometry. As you can see there is a tiny bit of an issue with the elbows not being able to stretch fully outwards, but apart from that and a minor issue with the hips, everything seemed ok. This dog rig was given to me to practice animating with as the model is similar in anatomy to the fat rabbits/warren. I decided to animate a lumbering hop-cycle similar to the walk that I was going to apply to the fat rabbits. For the rabbit characters I wanted to keep them looking relatively realistic, with slightly exaggerated proportions. However the feedback I received for the design of the main character was that he looked a little too generic, and that there were some shots in the animatic where he looked a lot more appealing, so I changed the design of his face to be more round. The Bramblesnake is a character concept that everyone seemed to like, so it was important to make him appear as visually interesting as possible while still appearing scary. Callum has the idea to make the snake look more Draconic instead of looking like a normal snake (as many people find snakes to have adorable faces), which would hopefully make him look scarier. We found no problems with the design of the Bramblesnake so we went ahead and modelled him. The Cloudhawk is only going to appear as a dark silhouette, so it wasn’t important what the details of the hawk looked like, only it’s outline. I looked at pictures of Red Kites as I loved their striking silhouette as they fly, with a distinguishing feature being the iconic forked tail. The Wolf is an important character and it was important that she looked really intimidating. I wanted to emphasise her mouth and her stomach. To do this I made her mouth really big, much bigger than a normal wolf’s, and made her stomach shrunken to give the appearance of a starving animal. Everyone was happy with the design of the wolf, so we stuck with it. Since the beginning I was always really keen on the idea of our rabbit carrying a leaf. Originally this was just as a cute little accessory, but since we implemented the rain, we decided that it would be used as an umbrella. After reading several articles (and from my own personal experience) I realised that the leaf umbrella would serve as a nice metaphor for a comfort item. Comfort items are very common and are used to help cope with stressful situations. As a child this could have been a blanket or a soft toy. Adults would probably find comfort in an item on their person. They would probably fiddle with their necklaces or twiddle their rings. A common comfort item in this period of time is a smartphone. A lot of anxious people usually find a small amount of sanctuary when they retreat to their mobile devices as an escape from the noisy and overwhelming modern world. The totems were used in the movie to let the bearer know whether or not they were still dreaming. In other worlds, they anchored them to reality. The leaf, I thought, acted as a very good comfort item for the rabbit, as she acts braver when she holds it, and breaks down when she no longer feels it’s weight in her paws. Because our animation is going to feature rabbits and have dark themes it seemed right to address the similarities between our film and Watership Down (1978) based on the 1972 book of the same name. Of course the stories are very different, what with Watership Down being about a warren of rabbits on a journey to find a new home after their previous one was destroyed, and then rescuing enslaved rabbits from an evil warren. Our story is simply about a rabbit conquering her fears in a very surreal and intense manner. Both stories, however, do touch upon the topics of overcoming fear and it would be silly not to at least use Watership Down as a stylistic inspiration. I’ve always loved how the rabbits actually looked like rabbits. Caricature was kept to a minimum, but yet the characters were still distinct and recognisable from each other. The backgrounds in the film were also beautiful and painterly, which made the characters stand out all the more. The bold colours and striking silhouettes on this fan-made poster looked beautiful and I thought it would be a nice inspiration for the more intense scenes in the film. Fiver’s visions in the animated movie are always surreal and abstract but yet are always very calm and spooky. I liked the tone and especially the colours as I think they bring a great mood to the film. I feel like they would be great references for the middle section of our film. Another film that I like that I want to draw inspiration from is Bambi (1940). The fight scene between Bambi and the rival buck/Ronno is very visually stunning with dark shadows and harsh lighting and colours creating a very intense atmosphere. I thought it would look incredible to try to replicate that style for the more intense lake scene of our film. I also went on Pinterest and put together a board of illustrations of forests/rabbits and wolves to get an idea for the kind of aesthetic we could go for. I looking through illustrations of forests, I thought it would be really nice to maybe attempt to give the backgrounds an almost watercolour-like texture to make the main characters stand out more. Another reference I was looking at was the game Ori and the Blind Forest. I only began to play this game rather recently, and instantly fell in love with it’s painterly art style and gorgeous atmosphere. How the game instills a sense of dread with little to no dialogue is remarkable. The tone is bleak and mournful, and is established purely through the visuals and the soundtrack. Our hero, Ori, is a white, glowing beacon of hope in the age of decay and fear. I would love to create something as visually stunning as Ori and the Blind Forest. Callum Luckwell’s research on the Major Project. I didn’t want to just regurgitate everything he found/said so here is a handy link. As a part of our Major Project, I delved into research into Anxiety, the disorders associated with it and what sort of ways in which we can portray this throughout our Short Film. Initially I contacted a friend of mine, Dr. Ryan Oakley, a Mental Health Counselor and acquired his help in both tracking down valuable resources to inform myself from, and getting some aide directly from him in understanding how to better portray it. From this I got an initial direction of where to look for animals that were all capable of feeling anxiety in the same way a Human would. Including Chimpanzee’s, Orangutan’s and Bonobo’s. Some Species of Monkey exhibit traits but lack deep enough study. Callum is the one who did most of the research on the disorder in the early stages of the project, whereas I looked at other media that portrayed anxiety. Alfred Hitchcock’s masterpiece is about an agoraphobic man named Scottie who also suffers from vertigo following a traumatic event in his past. Scottie’s dissociation and descent into madness is symbolised by a recurring spiral shape that often appears in the character’s eye. There is also the recurring motif of twin pillars. In fact, the entire film is full of psychedelic imagery (which I suppose was commonplace at the time, but not in a horror/thriller) which lends itself to a very surreal and unsettling film. Netflix’s most depressing cartoon was a big inspiration for this project. The show is also the subject of my upcoming thesis so I felt that it was only right to revisit it as a potential inspiration for the major project. BoJack Horseman is a show about a depressed horse who was a big-show television star in the 90s but has since lost all meaning in his life. A recurring motif in the show is water: this could be in the form of a lake, a swimming pool or an ocean. The water is always brought up whenever our titular character is feeling overwhelmed by life or by his own questionable choices. One of the most memorable episodes of the show (Episode 3×04) takes place entirely underwater, and features absolutely no dialogue. 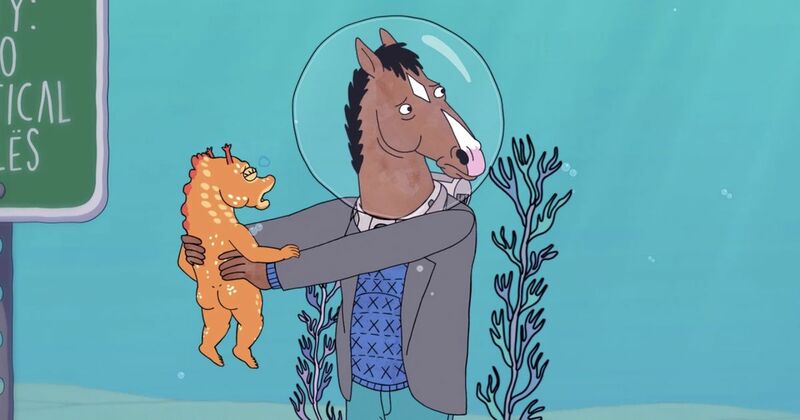 In this episode, BoJack is thrust into a surreal and unfamiliar world, and is caught of guard not only by the culture-shock, but by the overwhelming responsibility of caring for a lost baby seahorse, as well as juggling the dozens of promotional appearances in various clubs and theatres to advertise his new movie. During the entirety of this episode, BoJack appears lost and unsure of what to do. He is trapped by the water. All of the native sea life can communicate no bother, but BoJack is stuck in silence, unable to even hear what the sea creatures are saying. Life is muffled and stifling. He is also confined to the ocean floor, where he walks along the seabed while several species of fish are able to swim above him. The climax of the episode reveals that BoJack embraces the opportunities that water can provide, and swims out of a second storey window completely unharmed, and doesn’t fall to his death as he predicted. He conquers the overwhelming weight of the ocean and instead sees it as a medium of opportunity. There is also an episode which takes place almost entirely in BoJack’s mind, and gives his depression a voice. During the entire episode BoJack’s inner monologue can be heard, and is given it’s own chaotic art style. It is a brutal portrayal of depression. BoJack Horseman would serve as one of the biggest inspirations for our short film, as we admired its use of water to symbolise being overwhelmed, but also its surrealism and its effectiveness in making the world seem all the more unfamiliar and terrifying. There are also dozens of other films and television shows that touch on the topic of mental illness but few decide to express the disorders in a very visual manner.